No Brokers or solicitation of services please. Vessel Location: Alameda (San Francisco bay area). 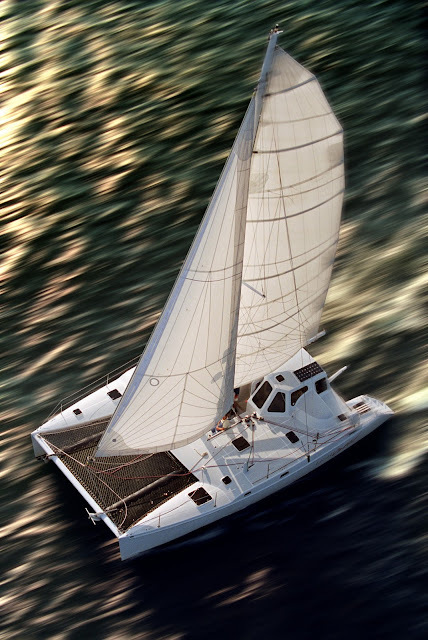 LightSpeed has proven very capable, very comfortable and very safe from the South Pacific to the Aleutians of Alaska. Despite her performance potential, she is easily sailed and well mannered single handed. ACTUAL winner of Multi-hull of the year. New generation 30hp Yanmar engines and transmissions 2010. Lots of new stuff in between. Delivery and/or coaching available to new owners. This is passage making on LightSpeed. Near Midway island in the Central Pacific and halfway from the Marshall Islands to the Aleutian islands. Pretty relaxed. Ahhh man...Lightspeed is SUCH an AMAZING boat! I'll trade you Cat2Fold PLUS my left nut. I'll include the titanium hardware that resides within said testicle. You can PM me the details of the sale.